Delicious mini muffins with bananas and chocolate chips. 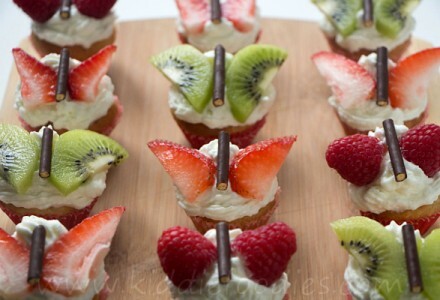 Decorated with whipped cream and cute butterflies made of fruits and chocolate biscuit sticks. I found a base for muffins recipe a long time ago, don’t even remember where, and I always use it with some variations. It is always delicious and my daughter loves it! Normally, we just have muffins with no decoration, but this time, there needed to be some – butterflies!